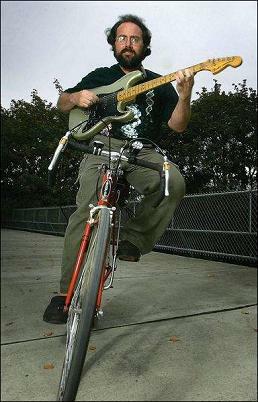 Since the early 1980s I have ridden tens of thousands of miles 'no hands' on a ten-speed bicycle while playing a Fender Stratocaster guitar at the same time writing hundreds of original songs. Is this beyond ridiculous to magnificent? You decide. Lyrics and mp3 downloads of dozens of these songs are available for free on this website along with essays on various subjects, stories, pets and YouTube videos. Here is a video of my I didn't know that she was crazy song played on a bicycle. ← Check out my Lego creations.